THE photographs speak volumes. Two back-to-back chimney stacks were all that remained free-standing from a terrace of six hours following a fire in Newbridge, Co Kildare on Tuesday. What happened to the walls? 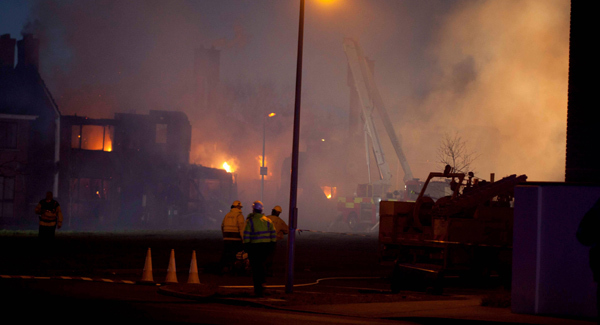 The fire occurred in the Millfield Manor estate. The starting of the fire is the subject of a criminal investigation, but a major question hangs over how fast it spread. Reportedly, the six dwellings were ablaze within 20 minutes. There was some controversy over problems with the fire engines’ progress to the fire being impeded by a blocked road but, in reality, the delay was a matter of minutes. Ordinarily, there is no way that the fire should have been capable of spreading so fast and, ultimately, completely destroying six homes. One explanation for the speed at which the fire spread has been the high winds at the time, but sources in the fire prevention business are very sceptical that winds could be the underlying cause. Kildare County Council has launched an investigation into the incident. A key feature of that investigation will have to be the speed at which the fire spread. One possible explanation that will have to be examined is whether or not the walls separating the houses were built as per design. In theory, at least, a fire should not spread from one house to another within an hour of it starting. According to the Department of the Environment’s building regulations, walls separating buildings are required to “have a fire resistance of one hour or more [and] should be constructed of materials of limited combustibility”. These walls should run “the full height of the building in a continuous vertical plane”. An obvious material of limited combustibility that is frequently used in such buildings is brick or concrete block. But if these materials were used above the ground floor in the burnt-out homes, there was no sign of them once the fire was brought under control. One way or another, the investigation will have to determine how the walls could effectively have caught fire like paper. There may well be an explanation other than a fault in construction, and if one is uncovered it will provide fascinating and valuable material for fire engineers and architects. Millfield Manor was competed in 2006 at the height of the building boom. It was built by a company called Barrack Construction, the main shareholder of which was a Kildare native by the name of Paddy Byrne. The company was formed in April 2001 but, in common with many other construction companies, it did not survive the downturn and went into receivership in May 2012. Former local Fianna Fáil TD Sean Power was the recipient of a donation from Barrack Construction ahead of the 2011 general election, in which he lost his seat. The company gave him a cheque for €1,840 for a “fundraiser breakfast and golf”, according to the Standards in Public Office declaration of donations. Meanwhile, the estate has been dogged by other, much more minor, controversies since it was built. New owners made a number of complaints about unfinished elements of the estate. In 2011, the estate appeared in a newspaper feature on the plight of residents in half-finished ghost estates. A few years ago, a controversy arose when the management company clamped the cars of owners who hadn’t paid up their management fees. The extent of the fire should merit a thorough investigation, but it would be difficult for such a probe to carry major credibility if conducted from within the local authority. Such an investigation might review the initial fire safety plan, which in 2006 — and to a greater extent today — is designed by a fire consultant. That consultant was then obliged to sign off on the completed construction to certify that the work has been carried out per design. This is process of self-certification has come under major scrutiny since the evacuation of Priory Hall in North Dublin over fire safety concerns in 2011. In a similar vein, the Irish Examiner reported in February about the shortcomings in fire walls that were part of the Longboat Quay development in the Dublin docklands. Longboat Quay was completed in 2004. The extent of the problems in that development are now the subject of a major survey, after which extensive remedial work is expected to take place. Another development in Dublin where major fire safety deficiencies were found recently is the Prospect Hill complex in Tolka Valley in the north of the city. Remedial work is also underway there. Apartments were built there in 2004 and, like the developer in Longboat Quay, the Prospect Hill developer has since gone into receivership. If any fire safety deficit were to be uncovered in the Newbridge probe, it would be incumbent on investigators to examine why a fire safety certificate was signed off on. Finally, the local authority might examine whether its own fire authority inspected the estate and, if so, whether any inspection reports were filed. Fire safety is the responsibility of the developer, but in the light touch regulation that pertains in this country, local authorities do make occasional inspections, although usually only to premises perceived to be high risk. Resources in local authorities for fire safety are a major problem right across the State. It may well be that there is no design or construction fault to which the extent of Tuesday’s fire is attributable. It may well be that something else was at fault. If this turns out to be the case, it is incumbent on investigators to complete their work urgently, in order to lift any cloud that might settle over anybody associated with the construction. The chief fire officer for Kildare did not respond to a request for an interview for this article. READ MORE: ?utm_source=link&utm_medium=click&utm_campaign=recirc">Is this apartment block the next Priory Hall?